Last week we kicked off a 2 part series with my actual lawyer, Matt Landis, where he answered questions submitted by you guys — today is part 2. We’re chatting about thrilling, but necessary topics such as copyright law, ownership of photographic rights, and crediting images! 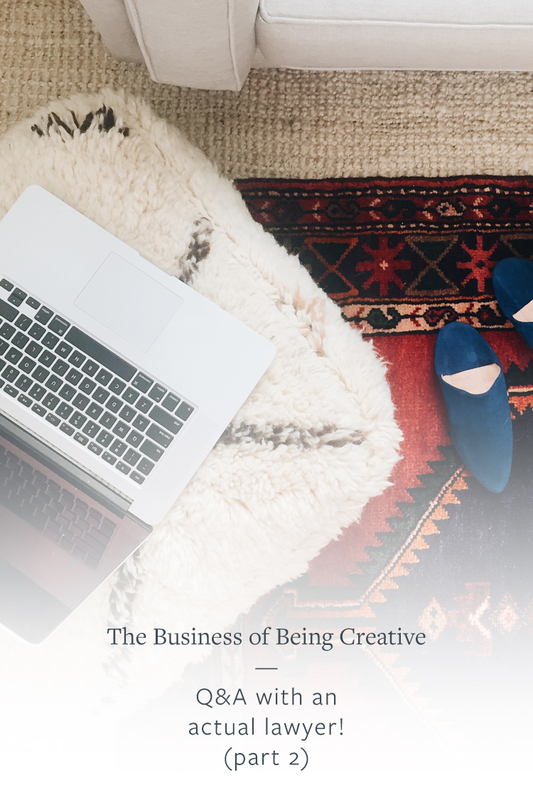 Keep reading to get all of the details for your own creative business pursuits. Q: What advice do you have for someone just starting out who wants to protect her content? A: As mentioned in the previous Q&A post, get a basic understanding of copyright law and take proactive steps to put others on notice that your content is protected by copyright law. Copyright law protects creative works that are “fixed in a tangible medium of expression,” such as photographs, graphic designs, literary works (including blog posts), sound recordings, video recordings, and visual arts like sculpture. Generally, the author of the work gains an exclusive bundle of rights in that work, including the right to reproduce it, publish or publicly display it, and create derivative works. Therefore, if someone copies your work without permission, they have committed copyright infringement unless they have a defense such as fair use. Proactive steps you can take are to put a copyright notice on your works when you put them out to the public and include contact information if someone wishes to license the work or inquire about use of the work. You could also register your work with the United States Copyright Office, which gives you additional rights in the event someone infringes on your work, such as statutory damages and attorney’s fees if you are successful in a lawsuit. Also, keep an eye out for those that may be using your content without permission. Contact them to request they take the work down or propose a licensing deal for continued use of your work. Q: Tell me a little bit about photography rights — who retains the rights to the photos on my blog? What if a photographer I hire shoots the photos? A: As discussed above, ownership of photographs is governed by copyright law. Whoever takes the photo is an author and owner of the copyright unless there is a work for hire arrangement or there is a written assignment of the copyright. For example, you are hired by a brand to provide a blog post which includes 2 photographs. In your contract with the brand, it requires that you own all intellectual property contained in the blog posts, and you grant them a license to use the intellectual property for the term of the agreement. If you take the photographs yourself, you are likely in the clear, since you are the owner. However, if you work with a photographer that isn’t an employee of your business, and you don’t have a work for hire agreement or a copyright assignment in place, you are likely in breach of your agreement with the brand. This could potentially subject yourself to liability for breach of contract from the brand and copyright infringement from the photographer who is technically the owner of the copyright and the exclusive rights that come along with copyright ownership. Q: Do you have any tips for properly crediting images that I pull from other sources? If you are asking for permission to use a copyrighted work, first, make sure you identify the actual copyright owner and contact them. For example, someone else may be using the work without permission as well. Then, make sure you are clear on what the terms and restrictions of your use are. Many copyright holders include a copyright license on their website that explains the circumstances in which you can use the work, and linking and attribution requirements. If you are unsure of whether your intended use falls within the terms of the license, contact the copyright owner. Works that fall into the public domain are generally works that one were protected by copyright and the term has expired, or copyright was forfeited or not applicable in the first place. Fair use is a somewhat complicated defense to copyright infringement, where the law provides the following factors that may relieve you from liability for infringement: the purpose and character of the use, the nature of the copyrighted work, the amount and substantiality of the portion taken, and the effect of the use upon the potential market. These factors are applied on a case by case basis depending on the facts and circumstances of each situation. Special thanks to Matt for all of his help and guidance answering these questions! If you’ve got more questions, leave them below in the comments and we’ll do our best to answer.